There are two main types of third-party logistics (3PL) providers and they’re not exactly created equal. Asset based 3PLs and non-asset based 3PLs each have their place in the market. However, they have a few key differences that can impact how your freight is handled and how much it will cost you. What are asset based 3PLs and non-asset based 3PLs? Asset based logistics providers own some or all of the parts of the supply chain. This can include carriers, trucks, warehouses, or distribution centers. Conversely, non-asset based 3PLs don’t own these parts of the supply chain. Instead they are relationship-based and develop a network of partners to help move your freight. Besides how they operate, there are some distinctions that are important for shippers to take note of. Since asset based 3PLs have their own carriers, those are the carriers they will rely on to move your freight. Their carriers likely specialize in specific lanes or services or may only have a presence in one part of the country. If those specializations match up with your specific needs, it could be a great partnership. However, if they don’t or if your needs vary, you likely won’t be receiving the most efficient or cost-effective service. On the other hand, non-asset based logistics providers have a wider network. They have access to multiple carriers which allows them to source the one that most closely aligns with your needs. That flexibility allows them to offer more customized solutions for your freight. Asset based 3PLs have more control over the supply chain because they own the assets that comprise it. What that results in is the ability to set their own pricing more easily because they don’t have to negotiate with an outside party. Asset based 3PLs also have more direct control over carrier issues and errors. They can implement changes with their carriers that non-asset based 3PLs simply can’t. Non-asset based 3PLs have less control, especially when it comes to what the carrier does. That’s because there are more hands involved with moving your freight. However, a quality broker will know what to look for to prevent issues and will have high standards for the carriers it keeps in its network. It’s hard to argue that asset based 3PLs aren’t inherently biased. They own their own warehouses and trucks, so it’s obviously in their best interest to have shippers use them over others. The interests of a non-asset based 3PL are more in line with the shipper than the carrier. The best brokers will work on your behalf to find discrepancies in your invoices, provide claims assistance, and use their expertise to help you ship more efficiently. 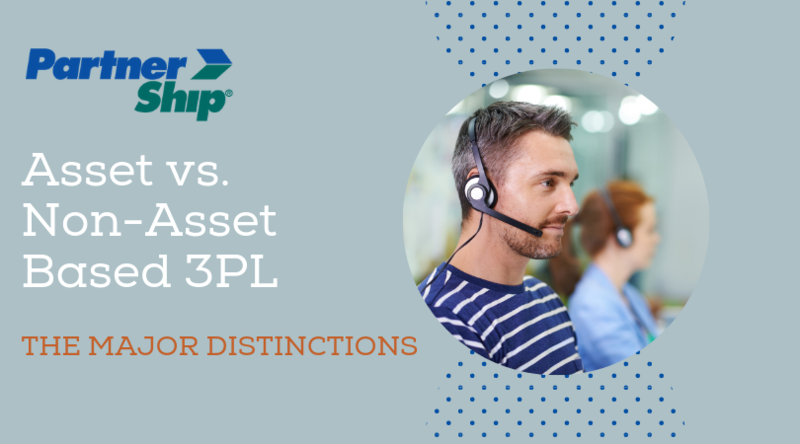 The type of 3PL that is best for you will largely depend on your specific needs. In general, you want to make sure you are working with a broker that can get you access to capacity when you need it most. From there, you should evaluate the typical characteristics of your freight so you can find a 3PL that is closely aligned. No matter the situation, you need to work with a quality broker that is dedicated to finding you the freight solutions you need. PartnerShip is a non-asset based 3PL with an extensive network of alliances designed to help you ship smarter. Contact us to learn how you can save on your freight and improve your operations. Get a competitive, no obligation freight quote with up-to-minute shipping rates from world-class carriers. If you already have a PartnerShip.com account, simply log in to get your custom rate. PartnerShip helps you ship smarter and stay competitive. Our vast network of carrier partners, strong industry relationships, and shipping expertise gives you the peace-of-mind that only comes from working with a trusted partner.